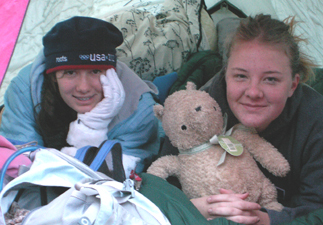 This page has tips for and answers typical questions from first-time women campers. On short trips, many ladies don’t, they just wear bandannas, braids or otherwise tie back their hair. or you can fill a few gallon bottles with water in the morning and set them in the sun all day. Then in the afternoon they might be lukewarm or will be at least be not too cold and you can lean over a restroom sink, pour them over your head, put on a little more shampoo than you might use at home and wash/rinse your hair. For long hair you might want four or five gallons. You can then refill the bottles and use the same ones for putting out the campfire that evening. Don’t pour soapy water on the ground, or wash hair at water faucets outside. No matter how biodegradable or ‘natural’ your brand of soap is, never use it in or near a lake, stream, river, etc. Every make/model of biodegradable soap pollutes. 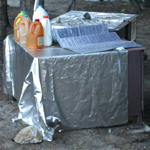 In Yosemite we put reflective covers over the campsite food storage locker (to keep down the heat inside and save on ice costs) and set the water bottles on top to warm up. and dry skin lotion (pack maybe more than one small bottle, but if you put one in your daypack for a hike, be sure to remove it before bedtime so you won’t attract animals to your tent), and maybe a little waterproof/sweatproof mascara. Your fingernails may have more wear, so a real, sturdy (metal? )’sapphire’ type nail file will be better than a paper emory board. Real nail clippers work for nails; scissors don’t. You need not-cheap sunglasses, wide enough to really help, with UV protection, and a hat with a wide brim. Please don’t bring thin, easily torn temporary rain gear like they sell at airports for emergencies. 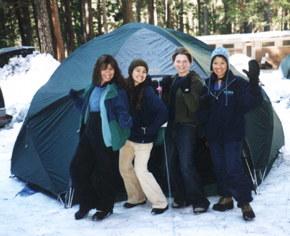 Snow or rain camp must-haves has details about how to dress to be warm and dry, and applies to camping when you just didn’t expect really cold or wet weather but you got it anyway. Many people sleep better with their favorite pillow from home than with a jacket wadded up under their head. Some of us pack a pillowcase to stuff that jacket or some spare clothes into. The precautions about bears below mention using pre-moistened, unscented cleaning towelettes. These are useful regularly to freshen up. Brands include Pampers Natural Aloe Touch or Target housebrand soft cloth baby wipes. Choose unscented. Choose a kind without diaper rash ointment. Put a few in a zip-lock bag in your pocket or day pack. You might want to write a “do not flush” reminder on the bag. 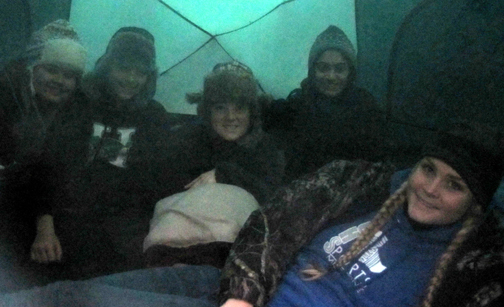 Can menstruating women camp or backpack around bears? Black bears are the kind we find on our California trips, for example to Yosemite and Lake Tahoe, and they do not tend to attack anyone unless threatened or a mom defending her cubs. Grizzlies live in the Rocky Mountains, not in California. Grizzlies have rarely attacked people. 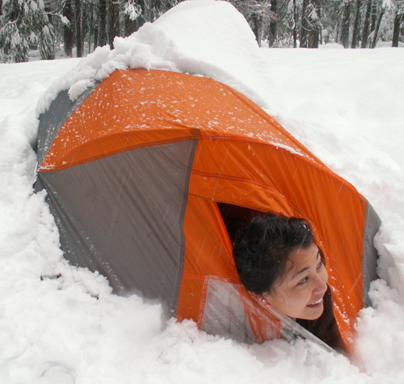 You can camp where either kind live. “Are grizzly bears overly attracted to menstrual odors? Place all used tampons, pads, and towelettes in double zip-loc baggies and store them unavailable to bears, just as you would store food. All odorous items that may attract bears, including food, cooking and food storage gear, toiletries, and garbage, must be kept secured from bears. The Glacier National Park Backcountry Planner said: “Stay clean, but avoid scented soaps, deodorants and cosmetics… Many women fill a heavy duty Ziploc bag with some baking soda, put used feminine products inside, and then put that bag inside one or two more heavy duty Ziploc bags. Never keep this bag inside your tent and always” (store it) “with food, garbage and other scented items” (which on our trips will be a a Garcia canister or the campsite food storage box). During a thunderstorm, don’t take a shower or use a sink, including washing dishes. Don’t talk on a land line phone. Don’t use your I pod. Don’t get zapped! Please read Thunderstorm and lightning safety It includes the answer to the question: Why can’t you swim during a lightning storm? A strike on a lake doesn’t kill all the fish in the lake. Backpacking Advice has these sections: Must bring for each large group (or perhaps for each couple or person), Must bring backpacking for each person, Some (crazy?) 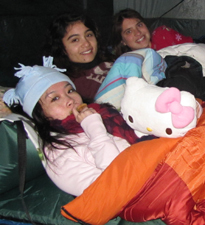 people think these are optional for backpacking, Backpacking luxuries(? 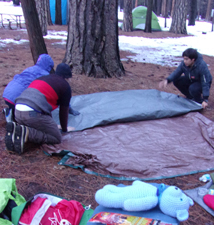 ), Do not bring these backpacking, To keep down on weight backpacking, Don’t rush out and buy, BACKBACKING FOOD, Low-cook backpacking foods, Yosemite National Park WILDERNESS PERMITS and Half Dome hike advice, ‘Leave No Trace’ camping has these basic principles.